* management of the Alliance Press web template developed by the Alliance for publishers who do not have websites (session facilitated by Mouhammed Diop, Senegalese developer and designer of Alliance Press). 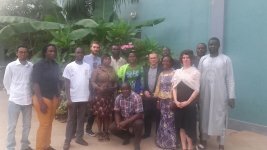 The workshop follows on the series of meetings/training workshops designed and implemented by the Alliance since 2010, and is aimed at publishers in particular from French-speaking Africa. In order to share knowledge and encourage ownership, all workshops and meetings of the Alliance are complemented by factsheets published on the Digital Lab website, and personalised online tutorials. The workshop will be held at the occasion of the Abidjan Book Fair (26-28 May, Palais de la Culture), and will provide the opportunity for publishers to share the collective stand of the Afrilivres association. The Afrilivres Prize will be awarded on that occasion, in the presence of the recipient of the 2015 prize : Valesse publishers from Ivory Coast.